Today I made a stand for Felix. Like the rest of the parts this is designed as a “2 1/2 D” structure. It should be easy for everybody to cut the parts with at laser cutter, a desktop CNC or easily convert the design to something you can print on your 3D printer. 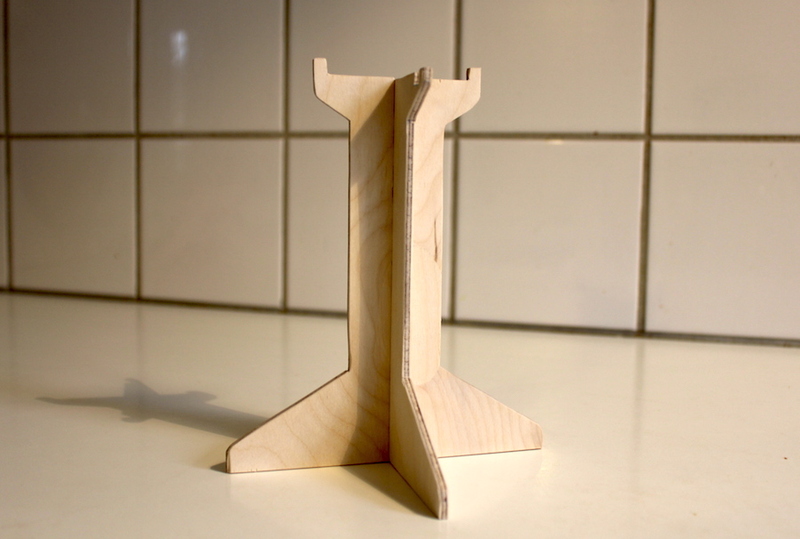 Or, you can just print it, glue it to plywood and cut it with a bandsaw or jigsaw. I have used plywood and powertools until now, and done some small corrections with a knife and sanding. 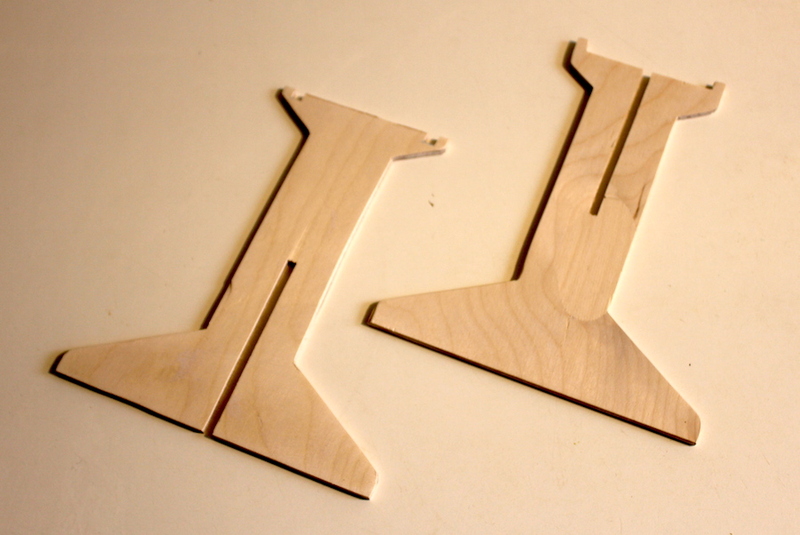 Next week I plan to visit our local fablab (http://fablabnordvest.dk) and laser cut my templates on 4mm. acrylic. I’ll be able to test if everything fits “right out of the oven” or if the design needs some adjustments. I’ll post the final templates as SVG. This entry was posted in Felix and tagged Robot on March 31, 2015 by ronaldx. Working with nodebots/johnny-five has being a remarkably positive experience. Because you can expose your objects to the REPL, it’s a breeze to test/exersize your code without having to upload it to the Arduino every time. The iteration cycle between changes is much, much quicker than regular Arduino sketches and the cognitive dissonance between what I do during the day and in my freetime is non existing. After implementing the simple trig IK function to control the position of the feet, I implemented two move sequences: “lift & place” and “drag”. 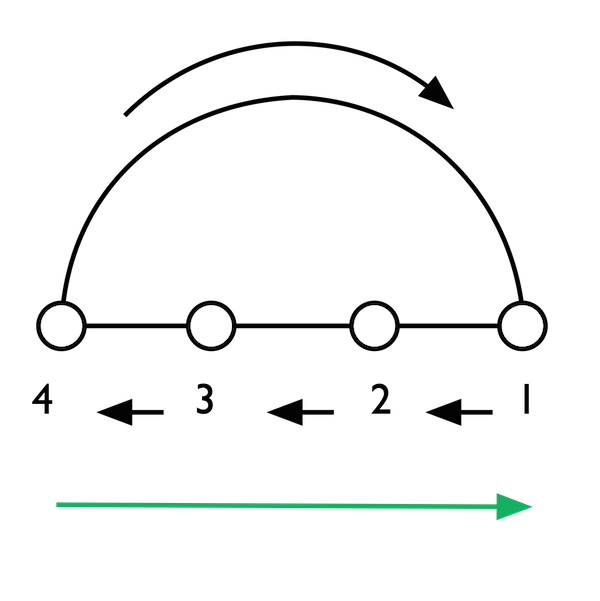 “Lift and place”, lifts the foot from the current position and place it at the requested x value (when the position of the hip is 0). “Drag”, well drags the foot along the ground from the current position to the required x position. To implement a creeping gait I divide a step into 4 available positions. From position one to five we have a drag and from position four to one when have a lift and place. As you can see from the video, Felix has a heavy limp. I’ll be working on the servo offsets so the small differences between the initial leg positions dont add up. Next I’ll start playing with some sort of dashboard with AngularJS and sockets.io. This entry was posted in Uncategorized on March 27, 2015 by ronaldx. This entry was posted in Felix, Robotics and tagged Robot on March 20, 2015 by ronaldx.